Digital Scout, the nation's leader in high school statistical software and apps, became a part of the nation's leading high school sports media company when PlayOn! Sports purchased Digital Scout this past February. PlayOn! manages the day-to-day operations of the NFHS Network which captures the passion, pride, and energy of the high school experience by delivering live high school sports and events to family members and fans whenever they want, wherever they are through www.NFHSnetwork.com, as well as mobile apps. The NFHS Network is a joint venture among the National Federation of State High School Associations (NFHS), its member state associations and PlayOn! Sports. “We are very excited about joining the PlayOn! Sports team,” Digital Scout CEO, Nathan Heerdt said. "We are thrilled to join an organization that has the same passion and excitement for high school sports and its fans as we do." 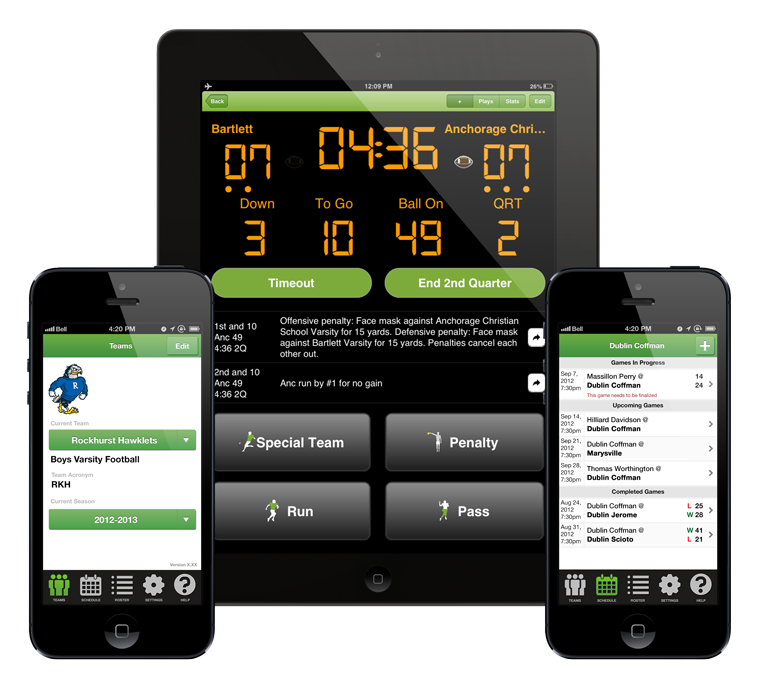 Digital Scout Football stat-tracking apps will be free again this year for all high school coaches. We'll also be working hard to upgrade and include live stat-tracking in more of our apps for volleyball, baseball/softball, soccer and more in the coming months. Starting this August, Digital Scout will offer more opportunities to increase fan engagement with Digital Scout products by integrating our DS Football and DS Basketball live stats on the NFHS Network site to accompany the live video coverage. With the combination of live gamecasts and live video events, the NFHS Network will have the most comprehensive coverage of high school sports in the country. Thanks for being a part of the Digital Scout coaching family. We're working hard to keep improving our products and supporting your continued success! As a coach, I know your time is limited. Creating and analyzing your team's statistics can be cumbersome - but it does not have to be that way. We recognize that everyone is clamoring for you to post your stats and scores to the paper, Twitter, Facebook, Instagram, etc. - and they all want it yesterday! With that in mind, here are six tips for stat tracking made easy. They will save you time off the field while appeasing your media friends in the process. 1. Track stats on a mobile device. The only people using pen and pad anymore are in the newspaper business...enough said. 2. Track stats live. Track your stats once and be done with it. No need to go back in and watch film to track stats. This will free you up to watch film and focus on technique and making your team better. 3. Get your scores out to the community. Make sure the app you use to track stats publishes your box scores to your approved sources (newspapers, state associations). Engage your fans and community with live play-by-play and increase fan support. 4. Create a list of all the people who you would customarily share your statistics with. Your coaching staff needs stats after the game. Also think of your media, parents, players, grandparents, college coaches, the mayor, mailman, whomever. Sending statistics to this group post game via your app will save you time and energy. 5. Make sure the app you use creates individual player statistics. Whether you have kids poised to play at the next level or you're tracking school records, you need individual player stats. Direct college coaches to a player's online page for authenticated stats that "YOU" created, and generate player reports during and after the season for every player on your team. 6. Make sure those player pages have the ability to upload video clips. There are some great video tools, as well as live streaming video companies out there. Make sure you have a program that has both authenticated statistics and the ability to upload video on one comprehensive platform. For the extra point- Remember those social media friends? Some programs will let you post statistics, scores, and plays directly into your Facebook and Twitter pages (If you're into that kind of thing). Ron Burgundy was wrong. 24 hour sports actually did work and changed the culture of television and athletics for that matter. But I wonder what Ron's take would be on a growing 80's industry called electronic communication, i.e. the internet? Well Ron I know what you're going to say and believe it or not it did work. In fact, some of America’s greatest papers were some of the early adopters. 32 years later, papers still struggle with how much, or how little, to put online as opposed to in print. I'd like to say, “Oh yes back then I combined Ron's sports skepticism with the papers’ internet intrigue to come up with HS Game Center.” But I would have only been 6 years old at the time. The truth is the birth of HS Game Center was a collective effort of amazing people here at Digital Scout that dared to be different and challenged the status quo in which sports information is received and disseminated. The evolution of HS Game Center is a bi-product of what the coaches need and what the high school sports fan wants. Coaches use our apps, another concept I loved Ron’s take on, to gather their stats for teaching purposes. When they do so, real time information is shared with the world. To me there is nothing more local than high school sports. It is feel good news that everyone can relate to. The 80’s papers were on to something. It’s just taken 32 years to make it happen. Better late than never.